July 17, 2018. Sumur, Ladakh, J&K, India – For the third day in a row, His Holiness the Dalai Lama walked down from his quarters on top of Samstanling Monastery to the teaching ground below. In the monastery courtyard and again below the gate groups of people had gathered in hope of catching his attention. He smiled, waved and exchanged a few words with as many as he could. Similarly, when he reached the front of the stage above the teaching ground, his gaze took in the faces before him as he smiled and waved to the crowd. Once he had sat down, he began the preparatory procedures for the Longevity Empowerment he was going to give. In the meantime, the chant-master led the audience in chanting the mantra of Arya Tara. When he was ready, His Holiness addressed the congregation. “Over the last few days I’ve met members of the public, inaugurated the Great Summer Debate and yesterday I gave teachings. So, today, by way of an auspicious conclusion, I’m going to give a Longevity Empowerment according to Wish-fulfilling Wheel of White Tara. “Have a good heart and remember that things do not exist inherently. Try to transform adverse circumstances into positive opportunities. If you keep bodhichitta and the view of emptiness in mind, whatever you do will be beneficial. “As I explained yesterday, the essence of the teaching of the Buddha is the practice of altruism. This is something all religions teach, but in the Buddhist approach it’s important to consider the altruistic action, agent and the beneficiary as lacking intrinsic existence. As we begin this Longevity Empowerment, set an intention to live a long life with a warm heart. 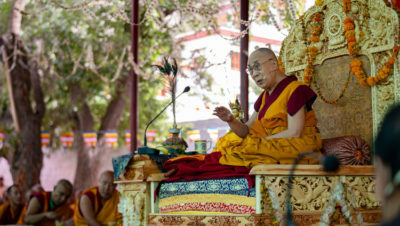 Of course, this empowerment involves Tantra, but from a Sutrayana point of view our practice should focus on generating merit, which ultimately gives rise to the form body of a Buddha and accumulating wisdom that gives rise to the truth body.” As part of the empowerment, His Holiness led the congregation in taking the bodhisattva vows. 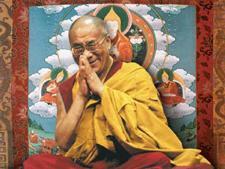 Once the ritual was complete, a ceremony of offerings and prayers for His Holiness’s long life began. It was led by the monks, but also involved local people who processed past His Holiness at key points, while others offered song and dance performances below the stage. Proceedings concluded with the recitation of the ‘Song of Immortality’, a prayer for His Holiness’s long life by his two tutors, the ‘Prayer to the Sixteen Arhats’, a ‘Prayer to Amitayus’ and so forth.